The clothing industry goes way beyond fiber, yarn, and fabric, says assistant professor Sheng Lu, of URI’s department of Textiles, Fashion Merchandising, and Design. An expert in the global textile industry and international trade, Professor Lu has a special interest in how the industry drives economic growth, creates jobs, and reduces poverty. The numbers in the global textile industry are enormous. “The United States imports clothes from more than 160 different countries, from China to Haiti,” says Professor Lu, adding that more than 120 million people worldwide work in the textile industry, many of whom are women from developing countries, such as Bangladesh, where 1,130 garment workers were buried alive when a factory collapsed last year. For most of these countries, the clothing and textile industry accounts for half to two-thirds of jobs and 60 to 90 percent of exports, most of which end up in European and North American retail shops. The Bangladesh tragedy sparked a global outcry for improved safety standards and working conditions in garment factories in poor countries. With increased globalization, the textile industry is becoming more involved in public policy debates, says Professor Lu. 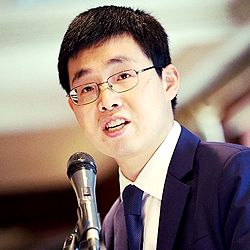 Those topics and more are explored in classes taught by Professor Lu, who recently won a prestigious international award for his research and teaching excellence.